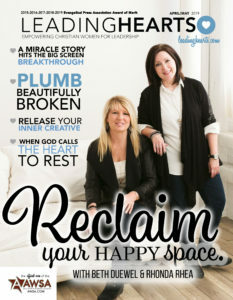 New Issue Sneak Peek: God Will Restore! Over the past month, I’ve witnessed devastation come into the lives of many around me. Tornados stormed through the south leaving a wake of pain and loss. Fire completely consumed the possession of a local family, leaving them clinging to the memories of the past and uncertain about the future. Flood waters swept through, carrying away hope in its path. What these situations have in common is a feeling of having portions of your life consumed by circumstances beyond your control. They leave you looking back at all those years invested in building and planning with a longing to get back what has been taken from you. I empathize with those walking through this pain because I have experienced it. The circumstances may not be the same, but the feeling of emptiness, grief, and hopelessness are understood. I have stared at areas of my life languishing from the attack of the “creeping locust, the stripping locust, and the gnawing locust” (Joel 2:25, NASB) and wondered how God could ever restore these years. How can He give back what appears to be forever lost? Years ago, a seasoned writer and speaker mentored me on how to build the ministry God had given me. We’d meet for coffee and discussed everything from adapting to different cultures to dealing with the zingers I’d get from posting God’s promises on social media. I took notes, asked questions and basked in her wisdom. One December day she paused from talking, reached across the table, took ahold of my hands and looked me into my eyes. Then waited. “Right,” I said, eager to please my mentor. “I make it a point to read Scripture and do my devotionals every day. And I read what other women are doing in their ministries to further God’s message. I’m seeking out ways to be a better servant.” I thought I had given the perfect answer. She took a deep breath and sighed, still holding my hands and looking intently into my face. “You’re mentoring me. I’m learning from you how to be better at what I do.” How could this answer be wrong?